The EIDE4030plus is a caching VLB super-I/O card with two different PATA controllers on it. One of them drives the two 32-bit "VESA IDE" headers that support HDDs up to 8.4 GB with caching but not ATAPI. 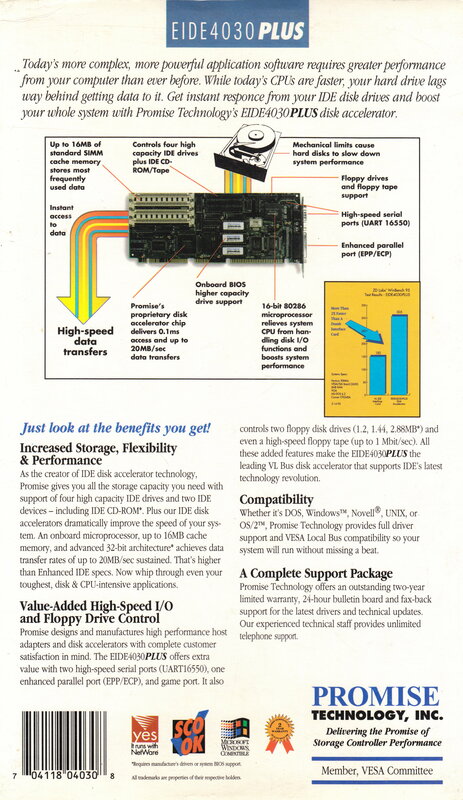 The other drives the ATAPI-ready 16-bit "ISA IDE" header that was included primarily to support CD-ROMs, but which can also support HDDs. The VESA IDE channel works fine for DOS. However, in Linux, libata would not detect the hard drive. The old ide driver (/dev/hda) detected it after timing out on a lost interrupt, but proceeded to print lots more warnings and errors and then trashed the disk. The potentially applicable CONFIG_BLK_DEV_4DRIVES driver (four drives on an IDE port instead of the standard two) just caused a kernel panic during boot-up every time it was enabled. I decided to focus my debugging efforts on libata. The result was a kludgy patch that allows error-free detection and read-only access to a disk on the VESA IDE channel. Unfortunately, writing to the disk from Linux still trashes it. The following sections step through the debugging process to show where the trouble spots are and maybe enable someone with more knowledge of libata to finally fix the problems. The system under test is DFI486 booted from CD-RW using Smart BootManager. The CD-RW contains a modified Slackware 14.1 boot environment with custom kernel and copy-on-write root filesystem instead of a large initrd in order to function with 32 GiB of RAM. The kernel detects the DVD-ROM on the ISA IDE channel but not the HDD on the primary VESA IDE channel. PDC20230-C/20630 VLB ATA controller detected. Alarmingly, the speculative probing for four additional IDE interfaces results in all of the mentioned resources being grabbed despite no devices being found there. That's a lot of IRQs to tie up for no reason. Since there is no nice way to stop the speculative probes on a system that has no PCI bus, delete the offending code block from function legacy_init in pata_legacy.c. This clears up that problem but does nothing about the HDD detection. libata has a force parameter to disable a drive that is detected but there is no parameter to force the detection and enablement of a missing drive. The point of failure for the detection of the HDD is function ata_dev_classify in libata-core.c. A PATA hard drive is supposed to show up here with a signature of 0/0. Instead, the HDD on the VESA IDE channel shows up with a variety of signatures. Worse, whatever the HDD's signature is at any given time, the non-existent slave device always has the same signature. Now the HDD is detected, but the PDC20230 driver has a different failure (failed to set xfermode) and disables the device. Furthermore, the resulting attempts to initialize the non-existent slave device are a slowdown nuisance that is NOT avoided by supplying the kernel parameter libata.force=1.1:disable. This change occurs in function probe_chip_type of pata_legacy.c. At last, the disk is detected and enabled. The pio_mask for the BIOS driver is PIO4 while for PDC20230 it was only PIO2, but it seems unlikely that this has any impact. Comments for function legacy_set_mode in pata_legacy.c say: "The BIOS configured everything. Our job is not to fiddle. Just use whatever PIO the hardware is using and leave it at that." Unfortunately, though at first it appeared to be working, I was unable to create an ext4 file system on a hard drive connected to the VESA IDE channel without it becoming corrupt immediately. So much for that. A hard drive connected to the (Winbond W83758P) 16-bit ISA IDE channel works without a problem in Linux, but there are additional complications. Regardless of configuration, even if the VESA IDE channel is supposedly disabled by jumpers, a working hard drive still must always be connected to it for booting to proceed normally with no hangs or HDD controller failure messages from the BIOS. If the Promise card is jumpered to make the ISA IDE channel primary as the instruction manual describes, the controller packs up and all drives become inaccessible. This failure is the same regardless whether the VESA IDE channel is disabled or merely changed to secondary. With the ISA IDE channel as secondary, a hard drive attached to it is not visible through the BIOS and does not show up in the setup menu ("Cache Setup Utility") of the Promise card. Setting the second HDD in the main BIOS to type 1 (the secret handshake to grant priority to the Promise BIOS) just causes hangs as it is looking for another device on the VESA IDE channel. So, being forced to allow the Linux-incompatible VESA IDE channel to have the first hard drive, I left the 6 GiB drive there for DOS and put a 12 GiB drive on the ISA IDE channel for Linux. To boot Linux with no BIOS access to the second hard drive I had to copy the kernel binary to the DOS partition and install LILO on a boot floppy. The complete patch applicable to kernel 3.13.2 is here. Function ata_dev_classify in libata-core.c: Forget about the device signatures and just hard-code the device classes based on inferred channel and device number. Keep the info message that reports the signatures received but make it more conformant. Delete superfluous code. Function probe_chip_type in pata_legacy.c: Reduce to one line of code; just return BIOS. Function ata_hpa_resize in libata-core.c: Stub out the function to skip the failing attempt to detect an HPA. Delete two other functions that the compiler then complained were unused. for Sound Blaster emulation but possibly MPU-401. A game port, parallel port, and COM2 are disabled by jumpers on the Promise card. The Aztech sound card apparently hooks IRQ 5 though the ALSA module has no such resource declared. An MPU-401 IRQ and a second DMA might also be in stealth use by the sound card, pending investigation. The PDC20230 driver might be made to work with a tweak to function ata_dev_set_mode in libata-core.c, which already notes in commentary that "Some very old devices and some bad newer ones fail any kind of SET_XFERMODE request but support PIO0-2 timings and no IORDY." No idea if using this driver would avoid the disk corruption problem that is occurring with the BIOS. Maybe the type 1 settings in the mainboard's BIOS were involved in the failures with the ISA IDE channel set to primary. Maybe when ISA IDE is primary the main BIOS settings have to be real. But then what do you do about the DVD-ROM? Or maybe that's what hung it.